Opening Sentences: When Mama tells me I’m goin to the Big House, she makes me promise to always be good, to listen to the Missus n never talk back, to lower my eyes n say, Yes, ma’am, no, ma’am, n to not speak less spoken to first. Synopsis: If I gave a star rating to the books I read, this one would be given five or more. What a powerful, moving, crawling-into-your-heart-and-staying-there, making-a-difference book! It’s a novel in verse, which makes for quicker reading than a regular novel, but the sparse, word-perfect text suits this difficult subject. Note that it is written in dialect, which may be off-putting for some. For me, it added a note of realism to the text. Grace has been taught that when you hear “auction block,” that’s the time to run — and the whole family does just that, enduring hardship, fear and danger until they are guided to a small community of maroons (escaped slaves living “free”) in the Great Dismal Swamp. Although fiction, this is based on research about the maroons who made such escapes to such a community. Wow, what a book. I was very surprised to see that the author is Caucasian. She did a very good job of writing other than her personal experience. The Kirkus review says “Told through Grace’s eyes in Southern rhythms that approach dialect with a poet’s careful sensibility, the story unfolds with a combination of historical precision, honesty, and adventure.” Well said. For Further Enrichment: You can find the author’s website here. The full Kirkus Review is here. 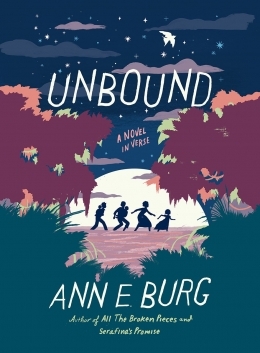 There are teaching resources and interviews with the author for this book and Ann Burg’s other books at TeachingBooks.net. Read an article in Smithsonian magazine about the Great Dismal Swamp maroons here. For another account of the lives of the Great Dismal Swamp maroons, see this website by Sylviane Diouf who is an historian of the African Diaspora, thus this webpage, and her book Slavery’s Exiles, come from an own-voices perspective. Availability: Since it was published in 2016, it should be readily available. Check your favorite independent bookstore, in person or online. Sounds like a great book. Thanks for the wonderful review. You’re welcome, Darlene. It is very good. I also really liked this book. The writing is beautiful. Thanks for getting the word out. It deserves wide readership.